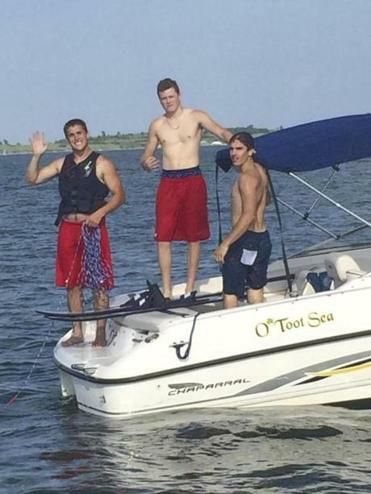 John Feeney, Joey Binda, and Elliott Chauvet helped save a man in the water in South Boston. An off-duty firefighter and three teenagers from Milton came together on Monday to rescue a man who was drowning in the waters off of South Boston. Sean Malone, 54, of South Boston, was swimming off the M Street Beach when he got into trouble. Sean is the brother of Deputy Fire Chief Scott Malone, according to Steve MacDonald, Boston Fire Department spokesman. Coincidentally, firefighter Chris Flaherty of Boston was working out with other off-duty firefighters at the L Street Bathhouse. While watching Sean Malone swim out, Flaherty, an experienced diver, became concerned about how far out Malone was going. Flaherty decided to grab a paddleboard from the beach and begin heading out to the spot where he had seen Malone swimming. When he arrived, he could not find Malone, who had gone under the water, MacDonald said. At that same time, 17-year-old Joey Binda, 18-year-old John Feeney, and 17-year-old Elliott Chauvet, all of Milton, were on the water in their boat, tubing and water skiing, when they saw Flaherty on his board waving his arms like he needed help, according to Binda. The teens’ powerboat seemed to come “from out of nowhere,” MacDonald said. The youths picked up Flaherty, who was about 40 yards off the beach, Binda said, and the firefighter told them that Malone had disappeared. They joined Flaherty in searching the water for the man. While they were moving farther out, Flaherty spotted Malone, jumped off the boat, and swam to him. He had the teenagers turn off the boat’s motor while he swam back to them with Malone, who was unconscious, and talked them through lifting Malone onto the boat. Feeney and Chauvet assisted Flaherty in performing CPR on Malone, while the boat raced to meet two other off-duty firefighters, Ryan Long and Andrew Lane, at the bathhouse. The two firefighters were waiting with a defibrillator they had retrieved from the building. They did not use the defibrillator, but assisted in lifting Malone onto the paddleboard, all the while continuing to perform chest compressions, MacDonald said. More firefighters arrived at about 4 p.m., along with State Police and EMS, officials said. Malone was taken to Boston Medical Center, where he was in critical condition Monday night, according to MacDonald. The incident “touched home” for Flaherty, who knows Malone’s brother, Scott, one of the deputy chiefs assigned to Boston Fire headquarters, MacDonald said. After the rescue, Binda said, “I’m really glad that nobody panicked. I’m just glad we got to rescue him. It brought me and my friends a lot closer. Binda said that after the eventful day the teens went over to each others’ houses and told their parents what happened. “They all keep saying what good of a job we’ve done,” he said. Binda recalled telling his dad the news. At M Street Beach, people were shocked after hearing about the near-drowning earlier in the day. Rebecca Rotstein was with a group of friends and their dogs near the L Street Bathhouse. Officials had already cleared the scene when they arrived. “That’s really sad, and kind of scary,” said Rotstein, upon hearing that a man was pulled from the water. Rotstein lives only a few streets away, and comes to the beach often, but has never gone swimming, she said. She very rarely hears about incidents like this, she said. The family of Sean Malone is thankful for the quick response of those that helped him. “Sean’s family just wanted to pass on that they’re grateful for the work everyone has done so far to give Sean a chance, and they’re praying for the best,” MacDonald said. Lauren Fox can be reached at lauren.fox@globe.com. Follow her on Twitter @LaurenBFox. Alexandra Koktsidis can be reached at alexandra.koktsidis@globe.com. Follow her on Twitter @akoktsidis. Felicia Gans can be reached at felicia.gans@globe.com. Follow her on Twitter @FeliciaGans.